Upper gastrointestinal bleeding in critically ill patients is a little bit complicated to deal with. Any bleeding that comes out of the mouth and originates from esophagus, stomach, pylorus, 1st, 2nd parts of duodenum are considered to be upper GI bleeding. The source of the bleeding is to be identified in the first place before any intervention. When a patient is terminally ill, or is under prolonged hospitalization the cause of the bleeding may result out of a drug adverse effect. Many drugs like aspirin and NSAIDs (non-steroidal anti-inflammatory drugs) have a tendency to produce gastrointestinal ulcers and subsequent bleeding, and hence they are given along with proton-pump inhibitors that prevent the occurrence of gastric complications. The bleeding would mostly resolve on its own if the patient is taken out of blood thinners or anticoagulation drugs like digoxin and NSAIDs. Another important cause for upper gastrointestinal bleeding in the case of a terminally ill patient is due to the rupture of minute blood vessels while using an endotracheal tube or feeding tube. Endotracheal tube may also be used during surgery, and some patients have a tendency to regain consciousness during surgery and may dislodge the endotracheal tube causing upper GI bleeding. This type of bleeding is rather easier to deal with as it would heal on its own. In the case of chronic upper gastrointestinal bleeding in critically ill patients the cause may be due to a Barrett’s esophagus, esophageal ulceration, rupture of the esophageal sphincter etc. Cancer of the esophagus is well known to cause esophageal bleeding, but this could be diagnosed early enough before it could cause further problems. Drug over-use in the emergency departments and intensive care units can also cause upper GI bleeding by inducing esophageal and gastric varices and the bleeding starts from them. The first thing to do in case of an emergency is to stop drugs inducing anti-coagulating effect after consultation with the respective physician. The upper GI bleeding is now being intervened and treated without much hassles by the use of upper gastrointestinal endoscopy or esophagogastroduodenoscopy and using clips to ligate the bleeding sources. This is generally done if the hemorrhage is profuse and does not stop after substantial length of time. Application of coagulation factors into the area have been known to provide quick and permanent relief. The use of ocreotide by drip and appropriate antibiotics to counter Helicobacter Pylori super-infection can sufficiently manage upper GI bleeding. When there is upper GI bleeding at homes or in a hospice care setting where there are terminally ill patients, the first thing to do is to note the color and texture of the vomitus, as this could exactly tell where the bleeding is from. If the bleeding is from the stomach, it might contain gastric contents and sometimes bits and pieces of gastric mucosa. If the bleeding is from the second part of the duodenum or lower, the vomiting would be projectile and may contain some parts of bile. 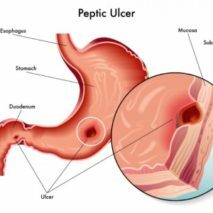 This is the first step to be done, and later on the source of the bleeding would be ascertained using upper GI endoscopy or barium swallow meal. Terminally ill patients generally have a tendency to develop upper GI bleeding and this could be countered successfully using the newly available tools and techniques.